Home CDN , children , crafts , feature , holiday , holidays , homeschool , January , papercrafts , printables , US , worldwide January 27th - Featuring Alice in Wonderland Freebies! January 27th - Featuring Alice in Wonderland Freebies! -- Charles Lutwidge Dodgson (January 27, 1832), better known by the pseudonym Lewis Carroll, was an English author, mathematician, logician, Anglican deacon and photographer. 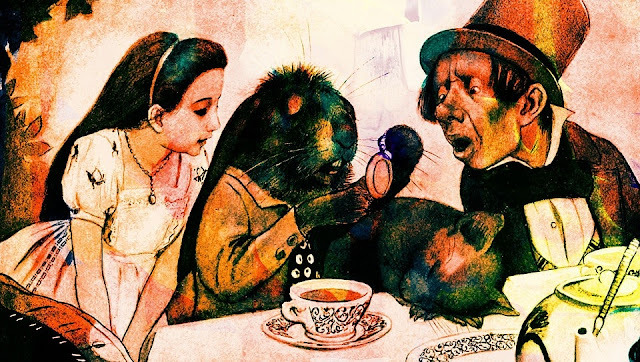 His most famous writings are Alice's Adventures in Wonderland and its sequel Through the Looking-Glass, as well as the poems The Hunting of the Snark and Jabberwocky , all examples of the genre of literary nonsense. -- Witty, whimsical, and often nonsensical, the fiction of Lewis Carroll has been popular with both children and adults for over 150 years. Canterbury Classics's Alice's Adventures in Wonderland takes readers on a trip down the rabbit hole in Alice's Adventures in Wonderland, where height is dynamic, animals talk, and the best solutions to drying off are: dry lecture on William the Conqueror and a Caucus Race in which everyone runs in circles and there is no clear winner. • Alice in Wonderland Large Picnic Set -- Large heirloom quality children's tea service features the original John Tenniel illustrations from the classic Lewis Carroll story. Each porcelain piece is hand-embellished in real gold. Service is food safe and dishwasher friendly! Set includes four 6" plates, four 3oz tea cups/saucers, 14oz teapot, sugar and creamer, four stainless spoons. Arrives neatly packed in custom fabric-lined trunk case for safe storage. • Disney Alice Plush Doll -- All in a world of her own, this soft Alice plush makes curious dreams come alive! Direct from Wonderland, this delightful stuffed doll features a shimmering satin dress with apron and fine lace trim. - On January 27 each year, the United Nations (UN) remembers the Holocaust which affected many people of Jewish origin during World War II. The day also commemorates when the Soviet troops liberated the Nazi concentration and death camp Auschwitz-Birkenau in Poland on January 27, 1945. It is hoped through remembering these events, people will remember the Holocaust and prevent genocide. - A chocolate lovers delight, and a day to eat cake. Why this a day to bake your chocolate cake... and eat it, too! On this day, a white or yellow cake will not do. Nor will part chocolate, part white suffice. It must be chocolate, all chocolate. You can make milk chocolate, dark chocolate, fudge, or any other type of chocolate cake. - Celebrates the system of calculating employee work hours through the Punch Clock system and it's invention. On this holiday, you are encouraged to share a day of celebration at your workplace. Management needs to have plenty of coffee, tea, and doughnuts in the break room so you and all your workmates can get together on your coffee break and celebrate the punch clock. - A national event in the United Kingdom dedicated to the remembrance of the victims of The Holocaust. It was first held in January 2001, and has been on January 27th every year since. The chosen date is the anniversary of the liberation of Auschwitz concentration camp by the Soviet Union in 1945. - Wolfgang Amadeus Mozart was born on January 27, 1756, in Salzburg, Austria. He began to study music with his father at a very young age and began composing when he was five years old. He spent his entire childhood travelling around Germany, Austria, France, England, Holland, Switzerland, and Italy, giving concerts on the organ, harpsichord, piano, and violin and being rewarded with gold rings and watches. - Auschwitz was a network of concentration and extermination camps built and operated in Polish areas annexed by Nazi Germany during the Second World War. On January 27, 1945, Auschwitz was liberated by Soviet troops, a day commemorated around the world as International Holocaust Remembrance Day. - A ceasefire to take effect at midnight was announced as the Paris Peace Accords were signed by the United States and North Vietnam on January 27, 1973, officially ending American involvement in the Vietnam War. - A holiday devoted to the man who invented the flush toilet. And we all should celebrate the toilet! Can you imagine life without it? It would be like camping in the woods your whole life. Thomas Crapper's plumbing company built flush toilets of Giblin's design in the 1880s. After the company received a royal warrant, Crapper's name became synonymous with flush toilets.